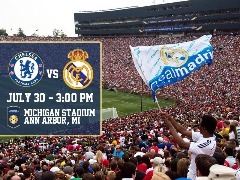 World-famous La Liga powerhouse Real Madrid and globally revered English Premier League club Chelsea will meet on Saturday, July 30, at 3 p.m. EDT at Michigan Stadium as part of the 2016 International Champions Cup. Michigan Stadium is the largest sports stadium in the United States. The venue regularly draws crowds in excess of 107,000 for University of Michigan football games and holds records for attendance in college football, professional ice hockey, college ice hockey and soccer. Real Madrid and Manchester United played the first soccer match at Michigan Stadium and set the record for the largest attended soccer match in the history of the United States with 109,318 fans. Another great crowd is expected as Real Madrid and Chelsea are two of the biggest and best teams in the world will meet there. This will be a marquee match of the tournament. Founded in 1902, Real Madrid has won the most European cup competitions in any club's history - a staggering total of 10 titles, its most recent arriving in the 2013-2014 season. In addition, the Royal Whites have been champions of La Liga 32 times, while winning the domestic cup 19 times. For more information on Real Madrid, please visitwww.realmadrid.com. Nicknamed 'The Blues', Chelsea Football Club consistently ranks among the best clubs in the world. The first club to ever hold both the Champions League and Europa League titles at the same time, Chelsea's iconic position as a central point of England's premiership continues to challenge the international soccer world. Chelsea won the Champions League crown in 2012 and followed with the Europa League title in 2013. In total, Chelsea has won five English Premier League championships, including one in 2015, seven FA Cup titles, five Football League Cup titles, two Cup Winners' Cup titles and a Super Cup. Additionally, the Chelsea Foundation boasts one of the most extensive community initiatives in sport, working in 30 countries around the world, helping improve the lives of more than 900,000 children and young people each year. For more information on Chelsea, please visit www.chelseafc.com.